Determining the location and the scope of the remnants of Craven’s Bastion is not as easy as studying those of Granville’s Bastion. Significant portions of the latter bastion remain standing under the Missroon Building at 40 East Bay Street, while the foundations of the former are obscured by large-scale nineteenth century construction. In short, it’s very difficult to pinpoint the precise location of Craven’s Bastion, and, without engaging in some very destructive excavation, it may be impossible to determine if any of its brick foundations remain below the modern street scape. Nevertheless, the historical record provides some valuable clues that offer hope for determining the approximate location of this once-formidable fortification. Craven’s Bastion was conceived in late 1703, but its construction dragged on for several years because of the general demand for bricks for the various fortification projects then underway in Charleston. It formed the northeast corner of the “walled city” of early Charleston, one half a mile north of Granville’s Bastion, and stood until the summer of 1789. As the last vestige of the city’s colonial fortifications to be demolished, Craven’s Bastion was surveyed and platted on several occasions because it formed an obstruction in the city’s post-colonial efforts to widen and straighten the northward extension of East Bay Street. The existence of several plats illustrating the growth of that street around—and then over—the vestiges of the bastion allows us to determine, with a moderate degree of confidence, the approximate location and size of this lost defensive work. A 1789 plat of Craven’s Bastion superimposed on a recent satellite image of the U.S. Custom House on East Bay Street, showing the approximate size and location of the bastion. Most of Craven’s Bastion is now under the expansive granite steps leading from East Bay Street to the west facade of the United States Custom House (built 1859–79). That site, once a mud flat washed by the tides, was filled with hundreds of wooden piles during the construction of the Custom House. Thus it is likely that the majority of the remnants of Craven’s Bastion were obliterated during the third quarter of the nineteenth century. The foundations of the westernmost part of the bastion, including its entry gate and a two-story brick residence, however, might still survive. Those portions probably lie under the broad concrete sidewalk on the east side of East Bay Street, and probably extend into the street itself. As the image to your right illustrates, a person pausing on the sidewalk to read the bronze bastion marker mounted on the south pillar of the Custom House steps is potentially standing a few feet from the gateway into the old bastion. 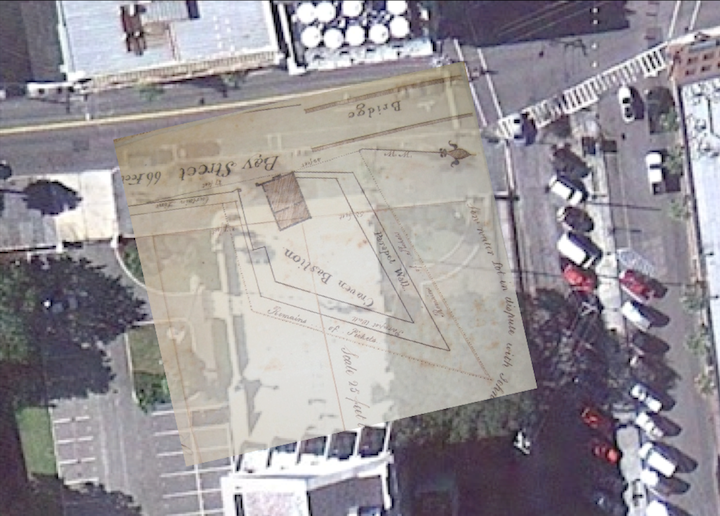 Permission for an exploratory excavation of this site might be impossible to obtain, but the use of ground-penetrating radar technology might reveal the outline of the bastion under the sidewalk. Time: Wednesday, May 28th 2014 at 6:00 p.m.